Happy Tuesday! It's Melissa from M Miranda Creations and today is my day to share with you here on the blog. I decided to use the new Special Packaging stamp set from the February Release. 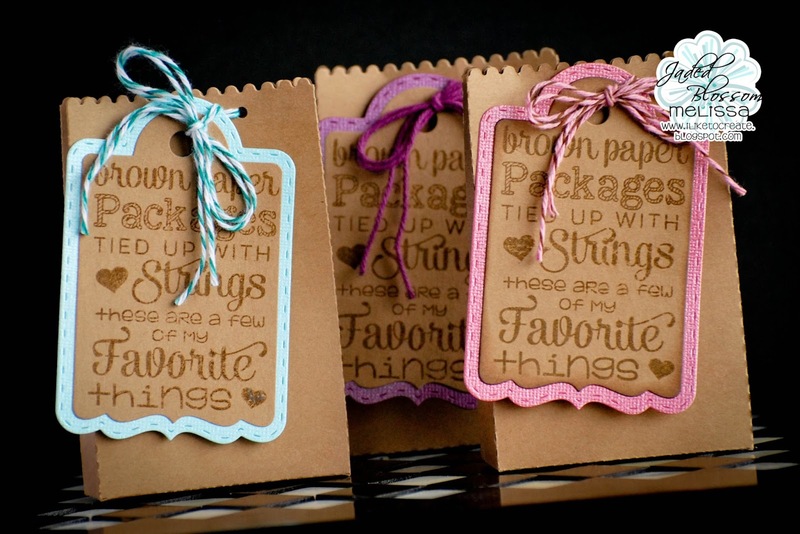 I really like this sentiment and by pairing it with the Goody Bag Die, I have the perfect little brown gift bags to stick in a gift card and a few pieces of candy or some other fun treat. It would be perfect for PTA members to make for teachers for Teacher Appreciation Week. Or maybe for co-workers with a cookie tucked inside. Wondering what you would use them for? I took some 12x12 kraft cardstock and die cut three bags. After assembling, I punched two small holes at the top. I then cut three of the tags from the Treat Tag Die using metallic teal, pink, and purple cardstock. I cut the top layer using the kraft cardstock again and stamped the sentiment with Walnut Stain Distress Ink. I attached the tags by threading two pieces of Trendy Twine through the holes on each bag, adding the tag, and tying them off with a bow.